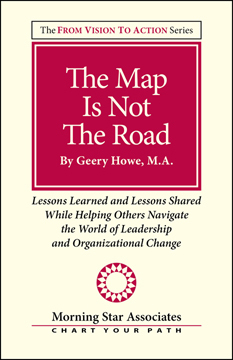 A Book About Navigating the Rich and Complex Topography of Leadership and Organizational Change -- As Told Through the Personal Stories of an Executive Consultant, Coach, and Trainer. I believe the reason why people remember a story more than research or statistics is because we are wired that way. We are built for remembering relationships and stories. Statistics, graphs, charts, and research help, but from my experience, a story is a long- term anchor in the midst of change. It becomes cellular and integrated more quickly than anything else. Therefore, the more I teach, consult, or coach, the more I find myself sharing a story. It builds perspective. It builds understanding. It builds a common ground where we realize that we are all travelers moving through a constantly changing and unfolding landscape. Included in this book are the stories I share with others to help them become better leaders in the midst of organizational change. Some are from my own personal journey. Others are stories shared with me. Whatever the source, the lessons learned are powerful. "Geery, this is the book your readers have all been waiting for, for decades! I cannot remember ever laughing so much in my life at any book this witty and endearing, and yet with profound and meaningful lessons-of-life that will forever reverberate in my heart and thoughts. They are especially funny to all who know, love, and appreciate you as the kind, caring, remarkably creative person and authentic teacher that you are. I do not find many things in this fragmented world "funny" anymore. But because this book had me totally in stitches, it was a life-changing book in the way that Mark Twain's Tom Sawyer and Huckleberry Finn must have been in their time. My husband and I have read all of your books, several times in fact. I was one of those people who often commented to you how memorable your wonderful life stories are. You said that so many others had also told you the same thing. So, Geery, this is your gift to all of us. Thank you, Geery Howe, Master Storyteller, perhaps one of the best -- and certainly one of the most beloved -- of all times!" “Oh my God. This is amazing. I got right through to you,” said the woman’s voice on the other end of the line. I smiled at her words because I personally answer the phone about 99% of the time. As I have had a home office since 1986, long before it was popular or a trendy choice in business, when I give people my phone number, it is my personal number. If I don’t answer the phone, the only other person who will answer the phone will be my wife. And she does not take kindly to being called my secretary. “We have some problems in our company, and I cannot figure out how to solve them,” she replied, before launching into an in-depth explanation. As it turned out, her entire company had recently been broken into teams, and all of these teams were connected to a specific business unit. Nearly all of the business units had written mission statements, which included discussing roles and responsibilities. They had defined external customers and internal customers, had metrics for everything, and the support departments were figuring out how to be supportive. The international office in Dallas had even designated a VP of Teaming, who was supposed to help everyone move through the four stages of the team process: forming, storming, norming, and performing. “Well for starters,” I responded, “I am sure you have already cut down some trees, if not a whole forest, and flattened them into paper. And then, of course, you’ve printed out a lot of material about this process. So, why don’t you just send me a copy of this material so I can look it over.” She wrote down my address and said she would send me the team leader’s binder ASAP. It was a good first step. I signed for the delivery and he entered a code into his hand-held computer and walked back to his truck. The moment I recognized the sender’s name on the package, I thought to myself, “When this woman said ASAP yesterday, she really meant it.” I walked back through the house to my office and opened the package. I had just taken the binder out of the box when my phone rang. “I see you have the package,” she said. “So, what do we need to do next?” I think she probably had been hitting refresh on her computer every couple of minutes to make sure I received the package on time. “Great. I will set the alarm clock right now,” she replied. And I dove into reading the binder. “Well, the best place to begin will be by sitting down together in person, and visiting with the leadership team.” I had already foreseen this next step. “My calendar is packed for the next two weeks,” I told her. “However, I have a small window of time open in the week following. We can begin then.” After discussing the details of our first meeting, I worked out my travel plans. At the appointed time, I spent most of the day traveling. The following morning, after a fairly restful night of hotel sleep, I drove to the company headquarters. Right away I spotted a young man standing outside holding a placard with my name on it. He looked quite cold. I parked quickly and hurried over to him. He was so relieved that I had made it on time. The poor fellow had been standing outside for 30 minutes just in case I might have gotten there early. After I signed in, the young man led me to the conference room where the first meeting of the day was to be held. He asked me if I needed anything and I told him I was good. Just then the door opened and the leadership team walked in. I have spent many decades in conference rooms. Some are big and some are small. Some have weird decorations and some are designed with an eye to elegance. This one was just normal, with several large chairs situated around a long table. Now, when you have spent as much time as I have in conference rooms, I always check on two things. First, how big are the containers for warm or cold liquids? Some companies have fancy china and others have company mugs. This place had huge, 64-ounce, gas-station-like mugs. Apparently, we were about to imbibe some serious caffeine during this morning meeting. Second, I check out the quantity of the food. Some places have chef-created, tasty hors d’oeuvres on fancy plates. Others have boxes of donuts the size of small tires. This place had more than enough 5”x7” chocolate bars for an entire middle school of preteens. “You have three basic problems,” I replied. “First, no one likes what is happening and how it is happening. People are also pretty upset by how difficult this work really is. From my experience, I have learned that if no likes the journey of change or understands what is normal in the journey of change, they then will not like the destination. Second, no one around this table is walking the talk or even talking the talk. One problem is that they do not understand the “new talk.” Therefore, they cannot translate it into meaningful explanations to those they work with, or into action that actually gets something done. Third, no one here understands yet what the destination actually is, let alone the desired results. If this whole process was working, what would it look like? What difference would it make? If the answers cannot be found at the leadership table, then they are not going to take hold throughout the rest of the company. “Let’s begin by creating some clarity about what you are trying to achieve and what is normal within change. I first want to share a personal story about moving outside my own comfort zone that may help all of you, given the challenges before you. A long time ago, …” And then I shared a story about my moving to Iowa from the East Coast to be a high school history teacher. This simple story further led into a meaningful discussion about real change and how real people move through real change. One of the challenges of being a leader is that we think our job is to come up with all of the answers. We are supposed to fix every situation and solve every problem. We are to get everything done before we rest. Having worked in the world of leadership and organizational change for several decades, I have learned many important lessons and shared many important lessons learned. Navigating the rich and complex topography of leadership and change has opened my eyes to unique perspectives and experiences. For example, in the discussion following my story, it become clear that those gathered had focused the most on what needed to get done and had not explained why it needed to be done in the first place, as well as why everyone needed to be involved. Unfortunately, there was a lack of Big Picture thinking. There also was no clear strategic direction for either the company or the change process. People were outside their comfort zones as a result of the changes being made, and without a sense of strategic direction, they ended up feeling lost, while simultaneously trying to protect themselves and their teams from further changes. Additionally, there was commitment without any solid understanding about what was normal. People wanted balance, order, and security -- and they were frustrated when it felt like chaos. By the end of the day, those around the table realized they needed to become a functioning team who supported one another, before they asked others to become a part of the team. They needed to gain strategic perspective, and they needed to build safety zones for engaging in strategic-level dialogue throughout the company. Only then could they transform their sense of chaos into a challenge. As it turned out, the initial personal story I had shared had opened up the group to a whole new level of sharing. I believe the reason why people remember a story more than research or statistics is because we are wired that way. We are built for remembering relationships and stories. Statistics, graphs, charts, and research certainly help, but from my experience, a story is a long-term anchor in the midst of change. It becomes cellular and integrated more quickly than anything else. Therefore, the more I teach, consult, or coach, the more I find myself sharing a story. It builds perspective. It builds understanding. It builds a common ground where we realize that we are all travelers moving through a constantly changing and unfolding landscape. What follows are the stories I share with others to help them become better leaders in the midst of organizational change. Some are from my own personal journey. Others are stories shared with me. Whatever the source, the lessons learned are powerful. So, let’s begin with the story about my coming to Iowa and being far outside my comfort zone, a normal experience for any leader planning to make change happen in their organization.